Malta, the Southern European country may be small in size, but still a popular destination for travelers. It is estimated that around 1.6 million tourists per year visit Malta, one of the smallest European countries. The island country joined the European Union in 2004, and abolished its borders with the other Schengen member states in 2007. It is a very safe country to visit, and there are no known terrorist activities to have taken place in it in the recent past. In 2017 alone, Malta received 37,881 Schengen visa applications from travelers around the world, visiting the country as their main destination. The number of visitors is much higher, taking into account the number of travelers that got a Schengen visa from other countries, and the number of countries the citizens of which can enter visa-free. Recently, Malta has been advertised as a medical tourism destination. It is popular especially with British medical tourists. UK residents are among the most frequent visitors in Malta, which is a former British colony. With its iconic lagoons, cliffs, prehistoric temples, baroque cathedrals, and other tourist attractions, the country has lured visitors from Britain, despite of having an area of only 316 km2. Who can apply for a Visa for Malta from UK? Since both countries are currently part of the European Union*, UK passport holders** can enter Malta without the need to obtain a visa, or any other kind of permit in advance. *The United Kingdom leaves the European Union on March 29, 2019. **Starting January 1, 2021, this category of travelers will have to apply for an ETIAS prior to their travel towards Europe, in order to be allowed to enter the territory. If you are still asking yourself “Do I need a visa for Malta?”, please check the list of nationals who are required to have a Schengen Visa. However, to be eligible to file a Malta visa application at the Maltese consulates in the UK you must have a UK residence permit valid for at least another three more months beyond the date you plan to leave Malta. Please note that if you are currently in the United Kingdom on a visa, i.e. tourism visa, you should instead apply at the Maltese Embassy / Consulate in your home country. 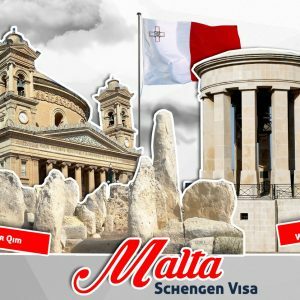 Those residing in the UK, and in need of a Schengen Visa to visit Malta, will have to collect and submit documents to support their Schengen Visa application. Among these documents, there are the general Malta Visa requirements, and the documents that are required specifically for the visa type you are applying for. Application Form – fully completed with honest and correct information. This form is the starting point of your visa application; therefore, you shall be very careful while giving your information in. If you want to make sure you will do everything right in order to have a successful application, you can apply via 3rd party websites like this one here. You will need to pay a fee for their services, which also include appointment booking, document checking, visa application and visa and passport collection. You can learn more about it here! A valid passport or travel document – issued within the last 10 years, and no older. Please keep in mind that this travel document shall have at least three more months of validity after your intended date of leaving the Schengen territory. Also, the passport should have at least two blank pages in order to be able to affix the visa sticker in it. UK residency permit – which confirms you are a legal resident in the UK. The residency permit must be endorsed in the actual passport. One photo – in color, taken within the last three months. All your facial features must be seen in the picture. No busy backgrounds, big accessories or face coverings are allowed. The photo must also comply with the other photo requirements and specifications as set by the Schengen members. Travel Health Insurance – which is obligatory to all those visiting the Schengen area. The visa applicant must submit a document that confirms they have purchased travel insurance that covers any medical emergency as accidents and illnesses in the minimum amount of 30,000 euros, in the whole Schengen region. Travel Itinerary – a document that confirms you have booked tickets from UK to Malta and back. Hotel Booking – which shows at which hotel you will be staying, its name, address, email and telephone number, as well as the dates from which to which you will be there. Letter of Invitation – by a Maltese host, or a foreign legal resident in Malta, who is a family member or a friend of yours. The letter should indicate the address of the house / apartment, its area / size, your relationship with the host, and the dates you will be staying there. Bank Statement – no older than three months, that states the amount of money you have in your account. A sponsorship letter – by a person residing in Malta or out of it, in which they confirm they are willing to financially support you throughout your stay there. In order for this letter to be valid it should be supported with sponsor’s bank statements. How to apply for a Visa for Malta from UK? Where to apply for a Malta Visa in UK? If you are still wondering where and how to apply for a Malta Visa in UK, following in this article, we have explained two ways to do that. Note that you cannot file a visa at the Malta Embassy in UK. the VFS Centers in London, Manchester and Edinburgh (for tourism and business visas only). the IAM website by filling an online form. To apply for a visa through one of the VFS Center you will have to make an appointment, prior to showing up at one of their centers. Sometimes, especially during peak season when they are receiving a lot of applications, you will have to wait for a while for your appointment. That is why, to avoid any possible delays, you are highly recommended to apply through the IAM website by filling an online form. The IAM website offers you help with appointment booking, documents’ checking, visa application, and visa and passport collection for a symbolic fee. IAM’s visa consultants will contact you as soon as possible to verify the suitable date and time for you to attend the Maltese visa-processing center in the UK. They will fill in an Application Form for Malta Schengen visas online to secure your appointment and send it to you together with a complete list of Malta Visa requirements and the criteria they should follow, as well as the confirmation of your appointment. The IAM’s team will assist you in gathering the required documents and checking your prepared application to make sure your application has the highest possible prospect of success. If you cannot collect your passport yourself, IAM’s representatives can arrange to collect it for you. Alternatively, you may choose to have your application sent back by registered mail when you make your visa application. For more information, please click here or start the Malta visa application by filling the form online here! Visa applications for UK residents wishing to visit Malta can be filed at the VFS Visa Application Centers in UK, located in London, Edinburgh and Manchester. All applications will be assessed by the Malta High Commission, London. Every Malta visa application must be submitted in person and by appointment only, as explained above. Please note that they do not accept walk-in applications, therefore, an appointment is obligatory. The VACs are open every workday starting at 08:30 to 17:30. When to apply for a Malta Visa in UK? According to the Schengen rules, the earliest you can file a Malta visa application is 3 months prior to your planned trip. Whereas, the latest you can do so is two weeks before the date you are supposed to travel to Malta. You are strongly advised to apply for a Malta Visa in UK as early as you can, in order to avoid any possible delays. As a rule, Schengen embassies and consulates need to give a decision on a visa application within 10 working days at most. Malta Embassy in London is the only body responsible for Malta visa processing. In case the Maltese embassy in UK is receiving a high number of applications, this period can be extended. In specific cases, a visa decision may be delayed even for more than a month. That is why you must make sure all of your documents are according to the criteria set by the Maltese embassy, in order to avoid such delays. Despite of the fact that these fees are static and unchangeable until the Schengen members decide otherwise altogether, there are some categories exempt from paying this amount. The visa fee may also be waived for participants aged 25 years or less in seminars, conferences, sports’, cultural or educational events, organized by non-profit organizations. The decision will be made case by case according to the relevance of the event. Note: Keep in mind that these fees may change depending on currency fluctuations and can be paid only in UK Pounds. Payments can be made in cash, by credit or debit card. If you pay with a debit card there will be a fee of 1£ for each payment. Remember that a visa application fee is not refundable and does not guarantee that you will be granted a visa. The validity of a Schengen visa or Malta From UK depends on Malta Embassy in London that processes your visa. If you get a single entry visa, you will be given an appointed number of days to remain in Malta, i.e. 10 days, as well as the period within which you can spend these days, i.e. from 11 February to 28 February. Once you leave Malta, even if you have not spent the number of days permitted, you have no right to go back. If you get a double entry visa, you will again have an appointed number of days and period to enter and leave Malta from UK. However, the difference is that you will be permitted to enter twice. Remember that both entries should not exceed the number of days given in the visa sticker. In addition, both entries and exits should happen within the given period in the visa. Travelers that get a multiple entry visa to Malta, are permitted to enter and leave as many times as they wish, as long as they do not stay there longer than 90 days within a six-month period. Therefore, if you get this visa, whenever you wish to go back to Malta, just count whether you have stayed more than three months is the last 180 days. The multiple entry visa may be issued for three or five years. There are four Maltese missions in the United Kingdom: The high commission in London and General consulates in Belfast, Cardiff, Edinburgh and Isle of Man.